After 14 years, Moscow is renewing an effort to claim a vast territory on the outer margin of the continental shelf abutting Russia’s land mass in the Arctic. What are the economic benefits of acquiring the legal rights to this underwater area and is Russia’s claim likely to be approved? As the Arctic ice cap continues to melt, the countries bordering the region are taking a closer and closer interest in bolstering their claims to underwater territories in the Arctic Ocean while ensuring that potential conflict is avoided, with the U.S. Department of State holding an important conference on global leadership in the region in Alaska as recently as Aug. 31. 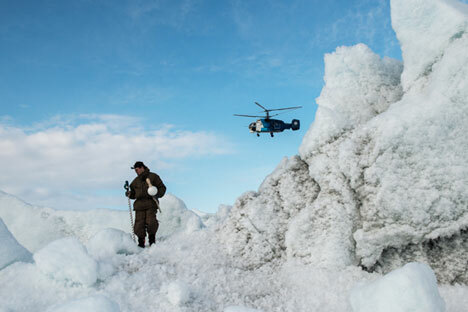 Russia is also taking more active steps to clearly define its presence and role in the north: After 14 years, it is renewing an effort to claim a vast territory on the outer margin of the Arctic continental shelf abutting Russia’s land mass. In early August, Russia submitted to the U.N. a revised application to claim the 1.2-million-square-kilometer (463,000-square-mile) underwater territory extending more than 350 sea miles from the coast, according to an announcement posted on the Ministry of Foreign Affair’s site. “For justifying its claim to this territory, Russia used a large collection of scientific data, accumulated in the course of many years of arctic research,” said the announcement. The potential economic benefits of claiming this underwater region are incalculable. “The Laptev Sea, as has already been proven, has a diamond canal on the surface of its shelf, which will allow Russia to become even more competitive with other countries in the production of diamonds,” said Vera Smorchkova, professor of labor and social policy at the Russian Presidential Academy of National Economy and Public Administration (RANEPA) Institute of State Service and Administration. Russia had applied to gain possession of a smaller part of territory on the Lomonosov Ridge in 2001, but did not have required proof that the territory was an extension of the continent and belonged to Russia, said Smorchkova, also assistant to the chairman of the Senate Committee on the Affairs of the North and Indigenous Peoples. The 1982 U.N. Convention on the Law of the Sea allows countries to expand their economic zones, provided that the seabed beyond their bounds is a natural extension of the continental margin. Denmark, Canada, Norway and the U.S. are also laying claims to sometimes-overlapping territories under the Arctic Ocean. This collective interest in the northern seas is based on geologists’ collective opinion that the seabed contains almost 30 percent of unexplored natural gas reserves and 15 percent of oil reserves. In the application, Russia lays claims to the Lomonosov Ridge, Alpha Ridge and Chukchi Cap, and to the Podvodnik and Chukchi Ocean Basins separating them. Russia’s application will not be reviewed in the near future for procedural reasons, but will be included in the provisional agenda of the 40th session of the Commission in February/March 2016, according to United Nations deputy spokesman Farhan Haq. “The decision to expand the shelf margins is not only of a geographical and economic nature, but it also risks becoming a political issue,” noted a chief analyst at UFS Investment Company, Alexei Kozlov. With heightening tensions between Russia and the West, the final decision to expand the shelf may be postponed under various pretexts, according to Kozlov. “Sooner or later, however, the issue will mostly likely be resolved positively, but the shelf will not become Russia’s territory without a fight,” said Kozlov. Russia’s claim to area in the Arctic will likely be opposed by countries such as Canada and the U.S., due to its rich deposits. Ed Royce, chairman of the U.S. House Committee on Foreign Affairs, said the U.S. should be prepared to stand up to Russia in this matter. “Russia has been aggressively pushing its claims to the Arctic, especially the resource-rich continental shelf. It now has an Arctic Command to strengthen its military presence in the region,” said Royce. Ecologists believe the ambitions of various countries equally threaten the Arctic. The melting of Arctic ice opens the broad expanses of the northern seas, making them vulnerable, said Vladimir Chuprov, director of the Greenpeace Russia energy program. “Millions of people are calling on governments to create an international reserve territory around the North Pole, in order that this water area remains untouched by industry and the nature remains wild,” Chuprov told RBTH. In a comment to RBTH, the press office of the Russian Embassy in Washington D.C. said that they see the Arctic as a territory of dialogue and cooperation. “We don’t see any insoluble contradictions in this region, especially questions which would require a military solution. All the calls that we are facing have no military connections. Minister Sergei Lavrov has stated this several times, emphasizing that it is necessary to leave the Arctic out of military rhetoric. We recognize that all our actions in the region should be regulated within the framework of international law,” said the statement.